Hi Jessica! Thanks for visiting my blog and leaving me a comment! My apologies that it took me almost six months to thank you and respond! As matter of fact, I just realized today that you had left me a comment! Mmm, the dumplings were so good, especially when it’s homemade! Thanks, Eric! The homemade kind is a cross between the store-bought dough and the dough for those fluffy buns. I think it tastes better homemade, although it is a bit labor intensive! Enjoy and let me know how it turns out! Thanks so much for this recipe. Just made up a batch of gyoza, and they were AMAZING. Love the simplicity of this recipe, I threw mine on the mixer for 10 minutes instead of kneading by hand, it all turned out lovely. Thanks! Thank you so much for this post. I will give them a try today and let you know how it turned out, i love gyoza!! Hi Jackie! I am so glad that gyoza turned out great! And hooray that your husband liked them too! Thank you so much for visiting the blog and leaving me such a wonderful comment! I went to your blog — LOVED it! It’s so great that you used to live in Japan. Your post about curry made me want to make the katsu curry for dinner! After you knead the dough you don’t need to rest it before rolling and forming the wrappers? I don’t let the dough sit before rolling and it comes out just fine. If you do decide to let it sit for a little, make sure to put a damp towel over the dough since it gets dry very quickly. 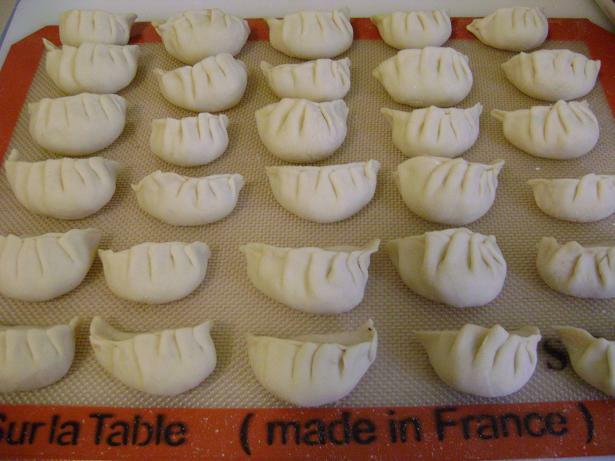 I will try it soon, I did it a few days ago but I didn’t roll gyoza by hand but using the italian machine for rolling egg pasta and I guess the wrappers were too thin, so I’ll try rolling them by hand next time! Thanks for the easy recipe! They turn out great! The kids love the dumplings (I couldn’t keep up with them, they ate them as they came out of the steamers)! It’s so lovely that you have the bonding time with your children over good food! My fondest childhood memories all involve sharing good food with family — those times are so precious for the young ones! I love that your kids like gyoza! What kind of dipping sauce do you use?